So I’ve switched back to Virgin Media. Back in 2008, frustrated by some IP issues and throttling, I moved from Virgin Media to O2 broadband. There was also the issue of cost. O2 were offering up to 16Mb for £10 a month, Virgin at the time were 20Mb for £37 a month so quite a difference. So after two years why switch? The main reason is speed. The image above is a test on my new connection this morning. A true 50Mb down but more importantly, 4.6Mb upload. Wowsers. Since leaving, Virgin Media’s XXL package has been upgraded from 20Mb to 50Mb. Nothing else on the market at the moment can touch this for download speed. Speedtest’s are all well and good – how’s the real world performance? Very good over the last week. Video’s, podcasts and, ermmm, ‘other’ large downloads are all delivered in record breaking time. I did some testing with DNS and I’ve kept with OpenDNS as I still find them the fastest option comparing them with ISP’s own DNS and also Google DNS. One of the issues with faster download speeds though is that upload speeds have never kept pace and so much of what I do, and want to do more of, is dependant on uploading. Uploading podcasts, uploading photo’s and HD video from the 550D and cloud backups. All take a considerable amount of time when you’ve only got 1Mb upload speeds. Virgin earlier this year announced an upgrade for everyone’s upload speeds so the XXL package now comes with 5Mb upload. Looking at the speed test above I am very nearly getting that and it is making a tremendous difference. Cloud backups and photo uploads are now four times faster. Considering some of the Flickr set uploads can take over an hour you can see how much a difference it makes. It also makes cloud backup a more realistic option. If your using Virgin Media, visit http://192.168.100.1/CmOpConfig.asp (your modems configuration page) to find out what upload and download speeds your modem is currently operating at. All this speed though comes with conditions. Firstly, £35 a month is a lot more than the £10 a month I was paying to O2. However O2 have recently changed their broadband tiers so I was likely to move to £20 a month with O2. Secondly, all tiers on Virgin have traffic management. During peak periods p2p and newsgroup traffic is throttled to protect other services. A lot of people cry fowl over this but I’d rather have that than a broadband service that is ruined by people stealing content which if we’re honest is the vast vast majority of p2p and newsgroup traffic. I know the complainers point to legitimate reasons for p2p and newsgroups but that just doesn’t wash. I’d rather have fast web, video , voice and game traffic over a totally unmanaged service. Another aspect of Virgin’s traffic management is that your connection speed can be throttled depending on how much you download and now also upload. 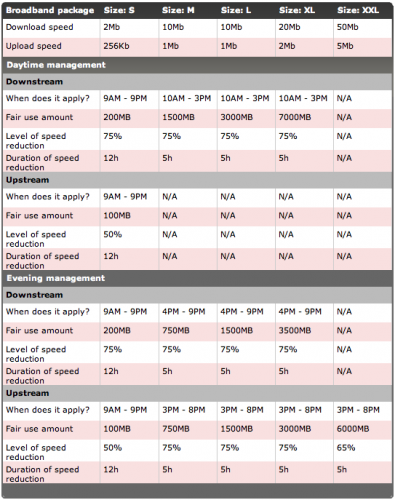 The table above is taken from Virgins current traffic management help page. Downloads on XXL aren’t throttled at all but if you have the new upload speeds they are. However it’s only after you’ve uploaded 6GB that the speeds is temporarily throttled back to 1.5Mb. Pretty generous and not going to be an issue for me. Any backups that I do will be scheduled for times when I’m not likely to be using the connection. Another reason for moving was a deterioration in the service from O2. Not only were average speeds starting to drop but connections were being lost every couple of days. I can accept slow but I hate when the service goes down. The internet connection is used for so much now that I hate unreliability. Overall I’m delighted with the service but as with all things it’s early days. Over the next 12-18 months Virgin are rolling out 100Mb down, 10Mb up for £43 a month. I’ll see how the cloud backups progress before deciding if it’s worthwhile moving as the speed at the moment is plenty enough for me. It’s interesting looking back to when I first got broadband and it was 1/2Mb down and that was plenty fast. Times change – i wonder what speed (and provider) I’ll be with in 2012? Supposed to be out getting some firework shots but missed the Glasgow Green show thanks to a late visit from the Virginmedia engineer. 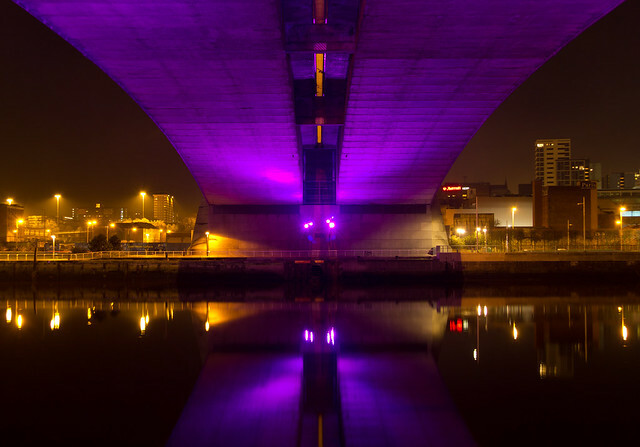 Instead, some shots of the Clyde at night.